Aerial Bucket Services provides northern Michigan with quality work at reasonable rates. We are also fully insured for your protection. When tree removal is the best option, let Aerial Bucket Services take your trees down safely. When a tree goes into decline, it can become a hazardous situation rather quickly. Trees that are in close proximity to people and structures can pose a serious threat – especially in a wind storm. Professional tree pruning and maintenance can help keep your trees looking healthy and vibrant. We can help shape your trees, thin out branches, remove deadwood and trim for clearance above structures and driveways. There are many scenarios that can alter stump grinding. Fences, landscape, patios, stairs, structures, and slopes all need to be considered for the stump machine accessibility. Call us anytime at 231-929-3131 for 24 hour emergency tree service for storm damage. A tree fallen onto a house is a very common occurrence in a wind storm, especially in our Northern Michigan area. We will take care of your storm damaged trees. 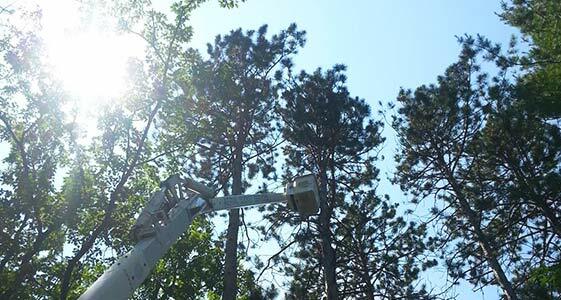 Aerial Bucket Services is a fully insured local Traverse City Tree Service Company with over 35 years of experience. We are a Traverse City Tree Service Company with a rich history of quality work, great service, and reasonable prices. We take pride in offering our customers “Quality Work, a Quick Response, at Reasonable Rates”. Each employee at our company takes part in our goal to perform safe, efficient, and excellent tree service. We ensure the highest tree care standard for our customers, and promises to put your needs first. Your trees and property are in the hands of well trained and qualified tree care professionals. Our estimators have years of experience in the tree care business, and can evaluate your trees and make recommendations with confidence. We are a Northern Michigan Tree Service Company with a rich history of quality work, great service, and reasonable prices.